TopSeos.com has released a list of the top 10 best search engine optimization companies and firms in Canada, and Cre8and9 has ranked as #8. 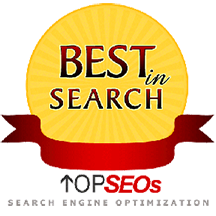 TopSeos recognizes SEO agencies that are innovators and leaders within the SEO industry. The ranking is based on a strategic evaluation done by experts and analysts at TopSeos. The evaluation of Canada’s search engine optimization companies take into account the key strengths, weaknesses, and competitive advantages of each SEO company. Ranking as a top 10 SEO agency in Canada requires the production of exceptional SEO campaigns, and SEO agency services. As well, TopSeos recognizes that the activity of an agency outside of the services they provide is also a common indicator of a leading agency. At Cre8and9, our philosophy goes far beyond offering simply SEO tactics. We place a great deal of importance and focus on user experience. We are unique in the sense that we are a multi-lingual agency, offering SEO services, web marketing, social services, creative solutions, and strategic services in multi languages. Schedule a consultation with us today, and see firsthand why we are Canada’s Top 10 Best SEO Agency.